The Chevron Pit blog has posted the second installment of "a series of personal stories about how the oil contamination left behind by Texaco [now Chevron] has impacted the people living near the oil company’s former oil sites" from the book 'Crude Reflections' by photographers Lou Dematteis and Kayana Szymczak. Below is an interview with Rosana Sisalima who lived in San Carlos, in the Oriente region of Ecuador, near Texaco oil wells, and waste pits abandoned by Texaco (now owned by Chevron). She succumbed to uterine cancer in May 2006; her husband died of stomach cancer. We pleaded with the oil company to clean the pits, and they finally showed up, only to cover the pits with dirt. But in heavy rainstorms, the pits overflow and waste runs into the streams, contaminating them. Uterine cancer victim Rosana Sisalima with her granddaughter at their home in San Carlos on November 24, 2004. Rosana succumbed to cancer in 2006. Photo by Lou Dematteis. Our house is located between a [Texaco] toxic waste pit and an oil spill. There are three [Texaco] oil wells nearby. A big oil spill had just occurred when we moved here. The oil company burned the oil and there was smoke everywhere. The former owner of this farm died of stomach cancer three years after he sold it to us. I’ve lived here for 22 years. I came with my husband and 10 children from Loja. We bought this farm which is surrounded by two [Texaco] open waste pits. So many animals fell in; chickens, dogs, watusas, rabbits. We pulled them out and cleaned them, but they were covered with sludge, and died anyway. We bathed in the river and got our drinking water there too. We pushed the crude aside and dipped in our buckets, and we ate fish from that river. We never realized the river was contaminated. I was diagnosed with uterine cancer in 1988. I went to Solca [the cancer hospital] and stayed there two months while they burned off the cancer until the doctor told me I was better. My husband died of stomach cancer. He grew coffee, and worked almost until the day he died. One day he stopped eating. We went to the doctors and they operated but he had a malignant tumor and the cancer had already spread throughout his body. He was 64, so young. My children have helped me with medical costs. We sold our cattle, and we had to sell half of our farm, but I still don’t know how we’ll pay the rest. 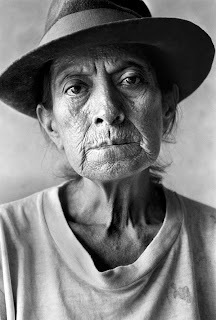 Portrait of Rosana Sisalima at her home in San Carlos, May 2005. Photo by Kayana Szymczak. Born and raised in Baltimore, Han Shan is a human rights and environmental justice campaigner living in New York City. He is an organizer with the Clean Up Ecuador campaign for Amazon Watch.